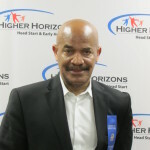 Mr. Bradley has been a member of Higher Horizon’s Board of Director’s since 2007. Prior to being elected Chairman, he served as Treasurer and Chairman of the Finance Committee. Mr. Bradley is an architect and principal owner in the firm, Bradley/Parker & Associates, Alexandria, VA. He is a member of the Mount Pleasant Baptist Church in Alexandria, VA, where he serves and Chairman of the Board of Trustees. Mr. Bradley is also a member of the Board of Directors, Burke & Herbert Bank, Alexandria, VA. He is a licensed architect and holds a Bachelor of Architecture degree from Southern University, Baton rouge, Louisiana. He is a member of the American Institute of Architects and the National Council of Architectural Registration Boards. As the Chairman, Mr. Bradley pledges, on behalf of the Board, to continue the tradition of providing great support and guidance to the Higher Horizon organization as the Board has done from its’ inception. Maryann Cornish, Executive Director at Higher Horizons Head Start and Early Head Start since 1977 is a tireless advocate for low-income children and families. Her work in the diverse community of Falls Church, VA has resulted in a strong reputation at local and national levels for sharing success stories regarding the role of culture and family in early childhood education, meeting the needs of dual language learners, preserving native languages and collaborating with community organizations. She has served in leadership positions within state and regional Head Start associations, resulting in collaborative efforts aimed at building effective early care and education systems. In 2000, she served on the faculty of the National Child Development Institute “Ensuring Quality through Leadership”. Her presentation, “Meeting the Needs of English Language Learners and Preserving Native Languages was made to over 3,000 leaders in Head Start and Early Head Start grantees and delegate agencies throughout the county. A Howard University graduate and a 1977 Head Start Johnson and a Johnson Management Fellow. She was awarded the Helen Taylor Award for Management Excellence by the Head Start Johnson and Johnson Fellows Program at the Anderson School of Business at UCLA in 2001. In 2013, she received the Golden Eagle Award for her work in early care and education by the Delta Kappa Gamma Society, International. 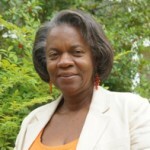 Ms. Cornish worked with NAEYC for its School Readiness Connections – video cast – a John S. and James L. Knight Foundation funded project. She was recently featured on a webinar in the Early Head Start National Resource Center’s Early Essential Series focusing on Self Care and Professionalism. 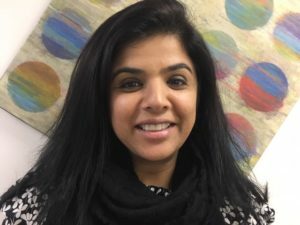 Nayyiara Siddiqui has joined Higher Horizons in November of 2018. She holds a Bachelors of Science degree in Finance and an MBA in Executive Management from St. John’s University in New York. Nayyiara possess over 10 years of non profit finance experience at institutions such as IREX (International Research Exchanges Board) in Washington D.C, New York University, School of Law and St. John’s University’s. She has also taught Business Statistics and Principles of Management at Northern Virginia Community College in Annandale, VA. Nayyiara volunteers her time as a Girl Scout troop leader, where her primary goal is to teach her scouts to give back to the community. She leads fundraising efforts for the PTA at her childrens’ school, and is an active member in her community. 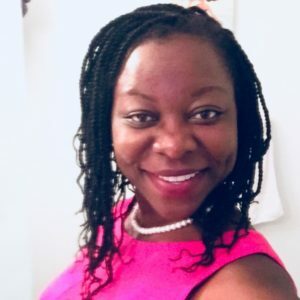 Francine Williams earned her Bachelor’s in Speech & Language from Temple University in Philadelphia, PA. She is a former Consultant and has many years of experience with the Head Start and Early Head Start Programs. Francine began as a Consultant for Higher Horizons in 2009; she was hired as the EHS Manager at Seven Corners in October 2012. Tanya Alestock has been with Higher Horizons for six (6) years, starting out as an Administrative Assistant and moving up to Data Manager. 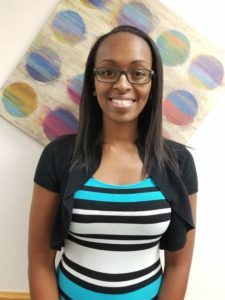 Tanya oversees ERSEA (Enrollment, Recruitment, Selection, Eligibility and Attendance); Child Plus for data tracking and analyzing for both Higher Horizons and Seven Corners. She ensures monitoring, agency collaboration and tracking enrollment services. Tanya has been involved with Head Start for years, starting out as a parent of two young boys at Gum Springs Children’s Center and hired as a Administrative Assistant overseeing Child Plus for Gum Springs Children’s Center. 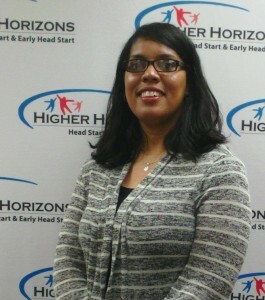 Tanya is also the staff liaison for the Higher Horizons Policy Council. 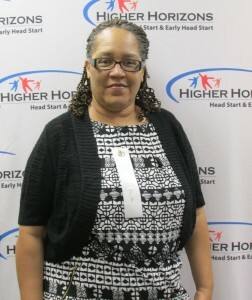 Julie Nethon-Williams manages the overall planning, assessment, direction and support for the Head Start Program at Higher Horizons. A native Oklahoman, Julie fell in love with Early Childhood Education when she was a child. Inspired by her third grade teacher, Julie quickly developed a deep passion for hands on learning and instruction. This resolve stuck with her through college, leading her to get her BS in Early Childhood Education and a MS degree in Curriculum Studies from Oklahoma State University. Over 12 years later, Julie continues to work in the field of Early Childhood Education and is happy spending her days working with the teachers, children, and families of Higher Horizons. Kim Alverson originally began with Higher Horizons in January 1984 as the schools’ first full-time Secretary until April 2001, moving on to Fairfax County Public Schools as an Administrative Assistant for 2 years. Kim then worked in her family’s construction business for several years before she returned to Higher Horizons once again in November 2011. 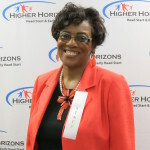 Kim earned a PHR (Professional in Human Resources) Certification from the Society of Human Resource Management in 2000, and currently is the Program Operations/HR Manager with Higher Horizons. Brittany Scott graduated from Bowie State University with a Bachelor’s degree in Social Work. Brittany also graduated from the University of Maryland Baltimore with a Master’s degree in Social Work. Brittany has over eight years of experience advocating and working with families. Brittany believes in keeping children and families together. 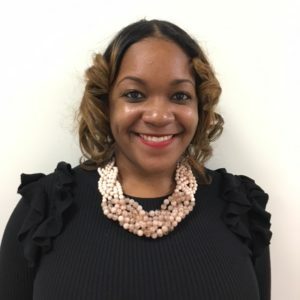 Prior to working with Higher Horizons, Brittany was a Recovery Specialist Supervisor at D.C. Child and Family Services where she worked closely with parents to reunify with their children in a sober and safe home environment. In 2016, she began her career at Higher Horizons as the Family Resource Manager. Ann Namabiro manages the Health Services Team at Higher Horizons. Ann graduated with a Master’s of Science in Health Education and Promotion from Marymount University in 2015 and is a Certified Health Education Specialist. Her interests are in maternal health, early intervention, children’s health and wellness, disease management and public health preparedness. Ann believes high quality health promotion provides the foundation for life long wellness and it is important to value the connection between health and learning. Prior to joining Higher Horizons, Ann worked with Anthem Inc. as an Outreach Specialist where she focused mainly on the Early Intervention program and health education. Ann is a Medical Reserve Corp who in her free time can be found volunteering in her community. David Evans comes to Higher Horizons with a love for children and a desire to make some difference in their lives, be it with a smile, handshake or just a simple “hello”. He, also, comes with a wealth of knowledge and experiences as a supervisor and a transportation specialist. He grew up in Martinsville, Va. and educated in the Henry School Public School system. Later, he attended St. Pauls College in Lawrenceville, Va. potentially pursuing a degree in Elementary Education. After much thought, He decided to follow in the footsteps of His cousins and uncles and become a professional driver. His driving experiences started with him at the age of 18 driving a 54 passenger motor coach and ending with driving a gasoline tanker for 25 years. Needless to say, he is licensed and qualified to operate all motorized vehicles. 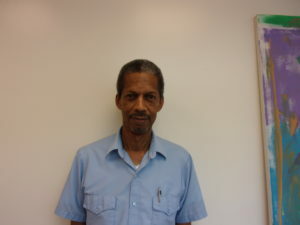 In addition to David’s successful driving experiences, he has been in supervision for many years. His first job was with A. L. Hodge Contacting Hauling. Some of the projects he was responsible for were helping to pave the runway at Ronald Reagan Airport, to extend the runway at Dulles International Airport, and to excavate the land for the erecting of the five buildings named for the United States’ presidents in Crystal City, Va. After the excavation job, he became a gasoline tanker driver for 25 years and later the operations manager for Fannon Petroleum. He supervised 11 drivers and ordered products and equipment for the company. After a total of 37 years, he retired in 2014. He is a member of Mount Pleasant Baptist Church, Alexandria, Va. where he is chairman of the Deacons’ Ministry, van driver, and a former Sunday School teacher of 1st and 2nd graders. David feels that it is an honor to be on the management staff of this great learning institution. He will continue to help make it a safe and comfortable environment for all. Nakeisha Rorie has taught at 7C Early Head Start for seven years and taught Kindergarten for three years. She earned her Bachelor of Science degree in Community Based Education. This degree focuses on Early Childhood Education and Elder Adult Education. In August of 2017, Nakeisha earned her Master’s degree in Educational Leadership. She’s always been passionate about teaching children and seeing their growth from the beginning of the school year to the end. Now, she takes pride in guiding the educators on how to teach parents to engage and educate their children through the Home-Based program. There’s so much to learn and even more to experience! I look forward to all the accomplishments that our scholars will make!